One To One were a band that formed in Ottawa, Ontario, in 1984. It consisted of vocalist Louise Reny and producer/multi-instrumentalist Leslie Howe. The duo had been in a local rock band since the mid-70s called Mainstream. Tired of playing covers of 60’s, 70’s and 80’s pop tunes, Reny and Howe were inspired to collaborate and release original material. In late 1985 they released “There Was A Time“. The song climbed to #1 on CFRA-AM in Ottawa, and #14 on the Canadian RPM singles chart. According to Canadian Bands.com, the single made the Top 20 in several European record markets. In the spring of 1986, One To One had another Top Ten hit in Ottawa with “Angel In My Pocket“. The single cracked the Billboard Hot 100. It also topped the pop charts in The Philippines. Their debut album, Forward Your Emotions, was recorded in West Germany. It earned them credibility in the music industry. One To One were nominated for Most Promising Group of The Year at the Juno Awards in 1986. They lost out to Glass Tiger. Leslie Howe was nominated for Producer of the Year, but he lost out to David Foster and his soundtrack to St. Elmo’s Fire. Howe was also nominated at the 1986 Juno’s for Recording Engineer of the Year, but lost out to Gino and Joe Vannelli for their recording of the Black Cars album. In 1988, One To One recorded their second studio album titled 1-2-1. The debut single was “Hold Me Now”, a tune that was not a cover of the Thompson Twins hit, “Hold Me Now” from 1984. 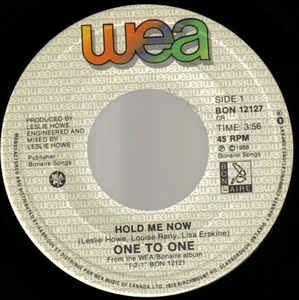 “Hold Me Now” by One To One, climbed into the Top 20 on CKLG in Vancouver and spent two weeks cresting at #13. In the song, “Hold Me Now”, the Louise Reny sings about seeing a guy that she wants to get to know. She’s not sure “how to play this game.” She wants him to “sock it” to her and hold her so she can “feel your heart right next” to him. The song proclaims “love’s the only thing that matters to me.” The song is set to a power rock format that is reminiscent of Huey Lewis and The News. In the midst of the promotion of 1-2-1, the duos label was folding. They got picked up by Herb Alpert’s A&M Records. Meanwhile, Leslie Howe produced Alanis Morrisette’s first album, Alanis (1991), and follow up Now Is The Time (1992). One To One went through a transition into new country-pop and a revised billing as One 2 One. However, their third album, Imagine It, didn’t catch on. Howe and Reny emerged a year later to form Sal’s Birdland. Their sound was now alternative rock. Another name change came with the billing of Artificial Joy Club. In this iteration, they had a #17 hit on the Billboard Modern Rock Tracks chart in 1997 titled “Sick And Beautiful”. After the Artificial Joy Club broke up in 1999, Leslie Howe continued to work as a producer. Meanwhile, Louise Reny sang vocals in Ottawa area bands Bubbles Cash and the Rhythm Method. Both of these later bands did covers of music from the 60’s to the 80’s, similar to the music Mainstream did before One To One was formed. Chuck Taylor, Crunchy Act Artificial Joy Club Melts Away Doubters With ‘Sick And Beautiful’ Single, Billboard, August 9, 1997.